January 30, 2017 – This week, we mark the anniversary of the first Baseball Hall of Fame class on January 29, 1936. 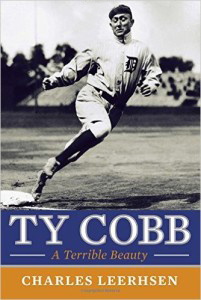 In that year, Ty Cobb earned 222 ballots, just four votes short of a unanimous decision, so the date gave us a chance to revisit one of our earliest interviews, and a book we cited often as a journalistic high water mark for history. Joining us again to chat about the unfairly maligned Georgia Peach, is Charles Leerhsen, author of Ty Cobb: A Terrible Beauty . Mr. Leerhsen scratched the myth of Cobb as a belligerent, dimwitted racist and dirty player, and found he’d been maligned by a hack sportswriter named Al Stump, who smeared a man who was in fact an intellectual, lover of children, and supporter of baseball’s integration. So how have baseball fans embraced the true story in the year and a half since the book’s publication? How has Charles Leerhsen fared after literally rewriting history to restore perhaps the greatest player ever to pick up a bat? We’ll dig into those questions, and then share the original chat for those of you who missed it. You can find our guest @CharlesLeerhsen on Twitter and at CharlesLeerhsen.com, or like the book at Facebook.com/TyCobbBook.